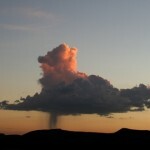 During this year’s monsoon season I captured an ideal example of a rain-producing storm cloud. Of course, as a scientist, I had to immediately clutter it up with labels to explain its components. If you’d like to see the unretouched original image, click on the thumbnail below. Then prepare for a lesson in basic thermodynamics. Sometimes, during our monsoon season, there’s only a single cloud in the sky. It forms over Lake Pleasant, a reservoir about 10 miles west of here and just beyond that mountain range. The lake is 30 km2 (11.5 mile2) with an average depth of 20 meters (70 feet). That’s a lot of water, and some of it went into creating that cloud. There’s nothing really unusual about this storm cloud, but it’s a textbook example that clearly displays all the important components of interest to meteorologists. There’s 8 components to a storm cloud, some of which are labeled above, and all of which are explained below. 1. Daytime heating: Monsoon season lasts, on average, from late July to early September. During that period, here in Arizona, daytime temperatures hover in the triple digits. The Sun’s rays heat the air, ground, and bodies of water like Lake Pleasant. Huge amounts of thermal energy are stored by the end of the day. 2. Evening cooling: After sunset, everything starts to cool. The air cools fastest since it’s less dense. The ground cools next, and in a couple hours you can walk barefoot on concrete. The water holds its heat the longest — it not as dense as ground, but H2O has the highest specific heat of any common substance (1 calorie/gram·°C). That means lakes will continue to give off heat long after sunset. They do that via heat radiation, like glowing coals, but the majority of the heat is lost via evaporation of water from the surface. 3. Convection: This warm humid layer of air that forms over the lake is not stable. If the air above is sufficiently cool, the warm humid air starts rising for the same reason as a hot air balloon. It’s less dense than the cooler air, despite the fact that it contains a lot of water vapor. As it rises, new air is pulled in radially across the lake from all directions. 4. Condensation: As the warm humid air rises, it expands in response to the decreasing atmospheric pressure at higher altitudes. As it expands, its temperature drops through a process called adiabatic cooling. If you’ve ever used a spray can, and noticed how cool it gets during spraying, that’s adiabatic cooling — the pressurized gas expands when released. When the temperature of the rising air drops below the dew point, its water vapor returns to the liquid state. These tiny micro-droplets will float in the air, same as fine dust. And if there’s a lot of them, they’ll scatter enough sunlight to become visible as a cloud. 5. Overshooting: Clouds that form in the manner described usually have well-defined bases. At the altitude of that base, the air temperature (which decreases with altitude) is at the dew point. But depending on the strength of convection (which can be significant over a lake), the rising air can sometimes shoot up higher than the bulk of the cloud, carried upward by its momentum to a higher altitude than its buoyancy can support. As a result, that air has to fall back down. The mixing of air that occurs at this point may also generate lightning — but more about that next week. 6. 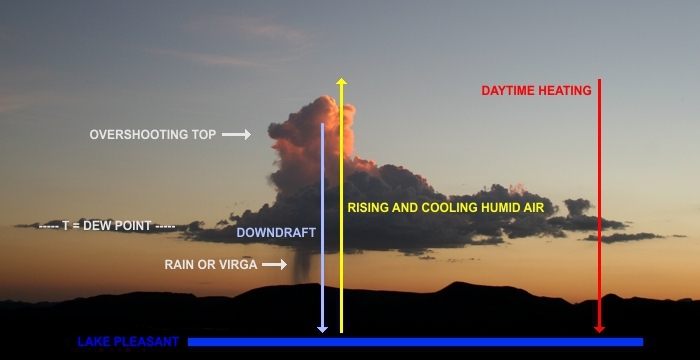 Downdraft: That falling air becomes a downdraft that can reach damaging speeds in larger systems. Sometimes called microbursts, these winds spread outward radially at ground level traveling at speeds that can exceed 270 km/h (170 mph). They can damage structures, down large trees, and pick up enough desert sand to to create a dust storm. In smaller systems, like the one over Lake Pleasant, the downdrafts are largely benign. 7. Nucleation: Somewhere along this “conveyor belt” of moving and mixing air nucleation may occur. Although this process is not completely understood (or we’d be able to seed clouds more reliably), the tiny micro-droplets of water begin to coalesce into larger drops. Static electricity surely plays a part, as does the presence of dust, pollen, or other particulates which can act as nucleation points for water droplets. If this process continues, the water drops will eventually become too heavy to “float” in the air. 8. Rainfall: Those largest drops will then fall as rain. In my photo, it doesn’t look like that rain is reaching all the way to the ground. It seems to be evaporating again as it descends into warmer air. This is what’s known as virga. In a larger system that reaches high enough altitudes, where the air temperature drops below freezing, snow or hail can form. Depending on conditions, they can also evaporate before reaching the ground. I called the system in my photo a “storm cloud” since it meets the meteorological definition: a heavy dark cloud presaging rain or a storm. I saw some virga at least, for maybe 10-15 minutes, but no heavy rainfall and no lightning. This was a relatively minor system. Now that you understand the basic processes that go into forming a storm cloud, we can take a look at a much larger system that formed over Phoenix last month. It dwarfed the “storm” over Lake Pleasant.